Stephanie Chen incorporates a flavor into her puff pastry for the "Patisserie Week" Signature bake. She is hoping cinnamon will add a spicy twist to her puff pastry which she hopes the judges will love. 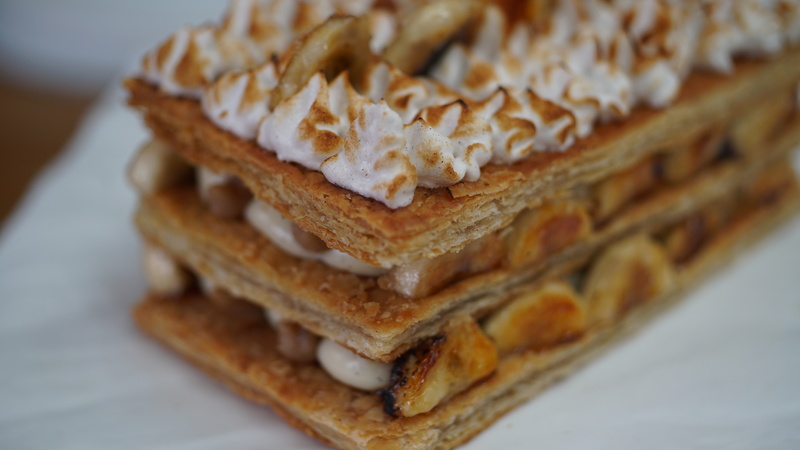 The puff pastry in Stephanie's "Banana Cream Pie" Mille-Feuille recipe will be layered with Italian meringue, banana jam and coconut pastry cream. This is a tough challenge but Stephanie is confident she can get it done. Watch the full episode of "Patisserie Week" from The Great American Baking Show Season 2 episode 7. 1. In a medium stainless steel mixing bowl, mix flour and salt together and get ice water prepared. Add a couple of tablespoons of water at a time and fluff the dough with your fingers and keep your fingers loose using a scooping motion. 2. Continue until alternating adding water and scooping flour together until the flour comes together in large pieces and holds together when pressed. 3. Shape dough into a square and wrap in plastic wrap. Place in the refrigerator for at least 30 minutes. It's ok if it is shaggy and not clean looking. 4. Take butter and pound together into a 4" x 4" square block and add 1 teaspoon of cinnamon on each side of the butter. Wrap in parchment paper and place into the fridge until ready to use. 5. Roll out the lean dough to approx. 7" x 7" square. Take butter block and place on the dough so it's at a 90 degree angle. Wrap the corners of the dough over the butter so they meet in the middle. Then pinch to seal. 6. Complete First and Second Turns. Flour the surface lightly and flip the dough with butter over so the seams are facing the counter. Roll out to be a rectangle approx 12 inches by 6 inches wide. Fold it in thirds by the top third over the bottom third and bottom over the top third. 7. NOTE: If any butter breaks through skin. Add a little flour to patch it up and keep rolling. 8. Rotate the dough so it looks like a book then roll it out again into a rectangle of 12 x 6" and fold again. 9. Wrap in plastic wrap and chill for 30 minutes. Mark down that you've done 2 turns. 10. Complete Third & Fourth Turn: Repeat same rolling out and folding dough two more times. If any butter pops out cover it with a little flour. 11. Wrap in plastic wrap and chill for 30 minutes. Mark down that you've done 4 turns. 12. Complete Fifth and Sixth Turns: Repeat same rolling out and folding dough two more times. If any butter pops out cover it with a little flour. Dough should be smooth and easy to roll out. 13. Chill for 1 hour in plastic wrap. 1. Preheat oven to 400 F / 200 C.
2. Prepare a large baking sheet pan by spraying it with PAM and then line with parchment paper and also spray the top of the parchment paper. 3. Roll out puff pastry so it is a rectangle that can fit on the pan and roll out to be 1/8 inch thick. Trim to fit to pan then cut into 3 strips. Prick each strip all over with a fork. Place that on the baking sheet. 4. Place another greased parchment paper on top of the puff pastry and place another baking pan on top of it of similar size and add a heavy oven proof glass baking pan. This will avoid the puff from rising too much in the oven. You can also use bricks if you have them. 5. Bake for 20 minutes. Then remove from the oven and remove top parchment paper and baking sheet. Dust the top of the pastry with caster sugar then bake for another 15 minutes without the top sheet. 6. Reduce temperature of oven to 285 F / 140 C. Check after 10 to make sure it isn't getting overdone. Make sure it's a nice golden color before you take it out. 7. Once the pastry is completely cool, trim edges of each piece. 1. Using a whisk, combine eggs, sugar and corn starch into a medium bowl and set aside. Prepare a metal sieve and bowl and set aside. 2. In a small saucepan, heat up coconut cream, milk and vanilla bean to a simmer. Temper some of the coconut cream with the eggs then pour the rest of the egg yolk mixture into the saucepan while whisking vigorously. 3. Return mixture to the heat and continue to whisk until mixture starts to slightly bubble. Transfer into a clean bowl and cover completely with plastic wrap. Place into the fridge to cool completely. 1. Take about 170 grams of mashed bananas, add brown sugar and lemon juice into a saucepan. 2. Cook on a low heat so that jam gets very thick and liquid is absorbed. Remove from heat into a bowl and set aside to cool completely. 1. Cut bananas into thin slices. Place on a heat proof rack or pan. 2. Add thin layer of maple sugar. Then add a generous layer of caster sugar. 3. Caramelize with a hand torch. Caramelize on both sides. 1. Combine sugar and water in a heavy saucepan. Mix to combine so it's like a white sand. 2. Cook sugar on low heat and stir until sugar has dissolved, then turn to medium high heat. Add the lid and allow it to come to a boil. The lid will keep the sugar from bubbling up. Use a wet pastry brush to get off any sugar granules. 3. Will want the mixture to reach 235- 240 degrees F. Once the mixture is around 220 degrees, start to whip your 6 egg whites in the stand mixer. Add in cream of tartar. Egg whites will need to be a soft peak by the time the syrup comes to temperature. 4. When sugar reaches 235-240 F, VERY CAREFULLY, remove it from the heat and gradually steam the sugar syrup into the egg whites on a low to medium speed. Pour sugar where the egg whites meet the bowl but NOT on the bowl. This will ensure it doesn't splatter or crystalize on the bottom of the bowl. 5. Once all the syrup is in, increase mixer speed to medium high. Continue to mix until you get stiff peaks. Add in cinnamon. 6. Keep mixing until the bowl has cooled to touch.